Carbon exists in the atmosphere, oceans, soil, rocks, fossil fuels, and living organisms, and is continually cycled through the Earth system. For example, the oceans absorb carbon dioxide from the atmosphere, and organisms exhale, digest, and decompose carbon compounds. 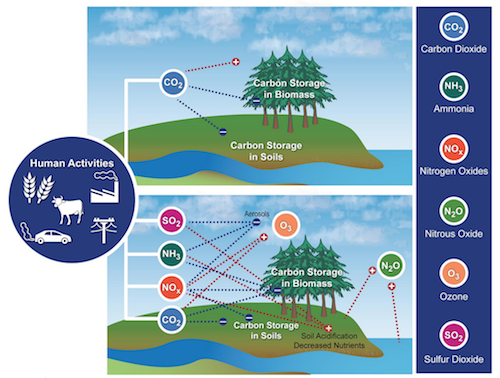 These and other processes of carbon storage, transformation, and release back into the atmosphere make up the carbon cycle. In addition to the carbon cycle, other key biogeochemical cycles include the nitrogen, sulfur, and phosphorus cycles. This diagram from the National Climate Assessment shows how altered biogeochemical cycles interact with climate. Click to see a larger version and more details in the NCA. In total, land in the U.S. absorbs and stores an amount of carbon equivalent to about 17% of annual U.S. fossil fuel emissions. U.S. forests and associated wood products account for most of this land sink. The effect of this carbon storage is to partially offset warming from emissions of CO2 and other greenhouse gases. To learn more about the carbon cycle and other biogeochemical cycles, explore the resources in the sidebar.